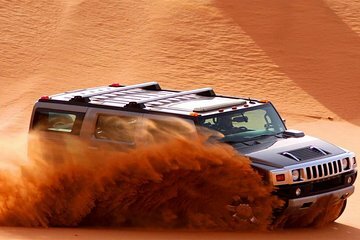 Zoom around the Dubai desert in style during this desert safari by H2 Hummer. Forget the ordinary 4x4 vehicles and jump into this luxurious car to zoom around the sand dunes in the morning, afternoon, or evening. Head to a desert camp and enjoy activities like sandboarding and henna painting as well as delicious Arabic snacks and a barbecue meal paired with soft drinks.